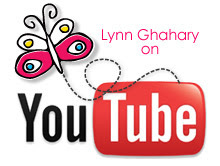 Lynn Ghahary :: Pieces of Me ...: Two Peas In A Bucket Garden Girl Blog Hop! Bella Blvd - FREE Digital Printable! 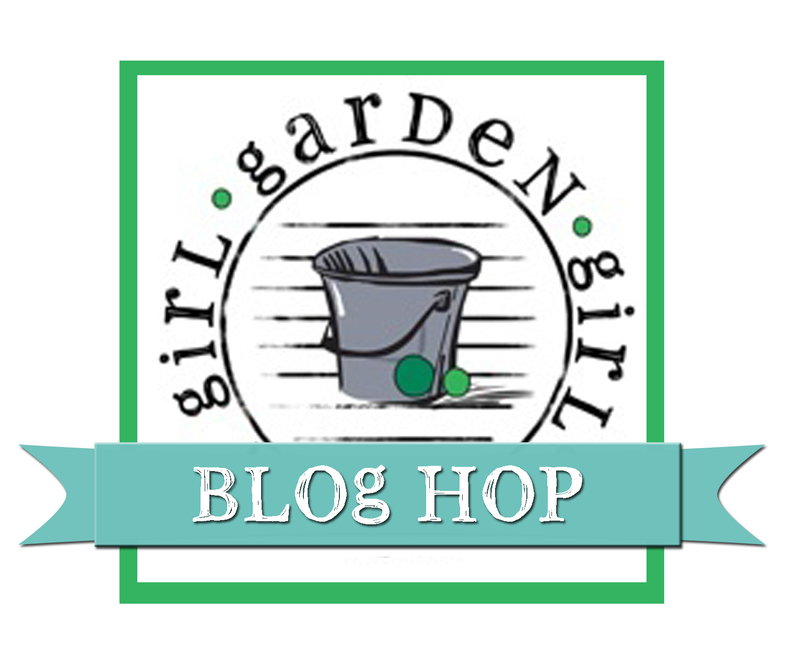 Two Peas In A Bucket Garden Girl Blog Hop! 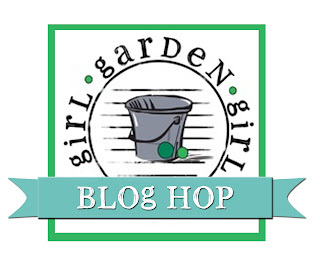 Welcome to the Two Peas In A Bucket Garden Girl Blog Hop! A Garden Girl is the title we receive as designers for the Two Peas website. As Garden Girls we create projects, host challenges, teach classes, and participate in events all designed to inspire your creativity. This week the Garden Girls are sponsoring special projects and giveaways on our personal blogs. Be sure to follow the list below as you hop from one blog to the next. Each Garden Girl is hosting her own giveaway so be sure to read the instructions for how you can participate in each contest. If you get lost simply either start at the beginning of the blog hop again or skip to the next blog listed below. Lynn Ghahary <--- that's me! For my project I created a layout about a recent experience with my oldest son Darian and his first broken bone. I used the fantastic new Boarding Pass collection by October Afternoon. Now you may be scratching your head wondering what a travel themed collection has to do with broken bones but here's my thoughts on this one. It's okay to use a themed collection for a non-themed layout. Yep it is. Actually it's more than okay - it's awesome! It's a great way to stretch those scrap supplies and make sure that you get the most use out of your stash. And here's the other thing - my layout is about a journey of sorts. It may not be about traveling the world or visiting some historic site, but it is about my son's passage into the world of contact sports (his first year in tackle football) and accompanying broken bones which was bound to happen sooner or later (or so I've been told by other boy mamas). Hence the title of my layout - rite of passage. The Boarding Pass collection has a fun and vibrant color palette and lots of great embellishments. I especially love the Miscellany and the Tin Pins. The great thing about many of the bits and pieces included in the Miscellany package is that you can flip them over and use the reverse for double duty. And that's exactly what I did for the tag housing my journaling. I also used several of the Printed Chipboard Shapes in a fun embellishment cluster near several of my photos. These shapes are so much fun and really easy to layer for lots of dimension and visual interest. What a cute little page! TFS!!! I think Boarding Pass is perfect for this "rite of passage" layout! Love your twine details, and the Tin Pin too! TFS! Love how creatively you used Boarding Pass. Great page! Now you make me really want the Boarding Pass line! I have had 3 boys play tackle football and luckily, no broken bones! Hope your sons heals (healed) quickly! And I love the travel paper on a non travel LO, great idea! Love the tip to use theme papers for other themes not related. Also liked the embellishment clusters that you made on the page! thanks! I love collections that can multi task! my son broke his arm also, never thought of using a travel collection to tell his story. i haven't scrapped those photos yet...hmmm great idea. Cute page! Thanks for the chance! Love the layout and love the Boarding Pass line. what a great idea! I tend to stay away from theme papers, but obviously I just need to think outside the box! Broken bones, never had to deal with but lots of bumps, bruises and stitches. Great layout. 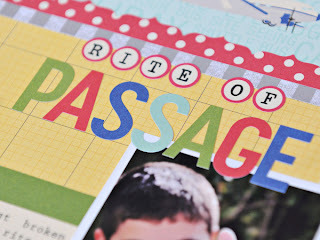 Love this page with all the fun colors and little embellishment details! GREAT page! Great lo! Poor Darian. I love all your details!! tfs. Awesome layout. 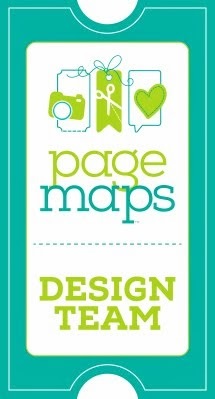 I love how you thought out of the box on your product choice & it works so well for this page! What a great use of this paper line! I would have *never* thought of that! thanks for the inspiration! Great page-so fun and colorful! Thanks for the chance to win... Love 2peas..
What a bright and cheerful layout! I like how you used the travel theme for this page. great idea! Hope his arm heals quick! I have two boys, so I'm sure I'll go through the same thing sooner or later! Love how you used the globe with the star! Adorable! What an original use of a travel collection...love it! Love all the extra elements that add dimension to the fun photos - the chipboard pieces, the twine - bright and fun. Your page is soooo colorful and fun!! thanks for the chance!! I loved the boarding pass. Adorable page. Thanks for sharing. What a great layout...he looks none the worse for the wear. Thanks! Love how you got great use out of themed product. what a graet lo. tfs. Great point about using "theme" supplies in a new and creative way! I really like this collection as well. Very nicely done. Wow, and double way. What a neat and creative way to commemorate such an event and new journey. I love it. This is so cute! Thanks for sharing this with us all! Keep them coming! Fabulous idea for stretching a theme-it could be applied to almost anything! I really like your layout..Boarding Pass is a fun collection! I like your page..Boarding Pass is a cute collection! How nice to see a boy layout! This paper is perfect for it. Oh my, one of my favorite collections by OA. TFS! I think your layout is fabulous and I completely agree with you about using "themed" items in non-themed ways. I like how you think "out of the box"
I've been SO inspired just by taking part in this blog hop and I want to thank you for all the time and effort each of you have made. And your generosity too. Love the idea of themed supplies and a non-themed layout! Love the layout - and love that you used themed for a non-theme page! I love how you used a travel line to create this layout!! It's giving me some new ideas. beautiful LO. Thanks for sharing. Hope he heals up fast! I love how you adapted the Boarding Pass line for this page! I love this layout..actually, I love most of your layouts. You are such an inspiration! Great page - thanks for the chance to win! So creative and PERFECT use of the boarding pass line! Love the bright fun colors, great layout!! Miscellany and tin pins are also among my all time favs! Love your page! Love this and your use of the theme/not travel! Such a cute idea! It works really well for your son's broken arm with the "rite of passage" title! Very clever! Fun page and you made a really good point about using themed collections. I will have to try that to help stretch the versatility of the products I have! I love that you put a twist on the themed product. Great layout! Cute layout!!! Thanks for sharing the great idea! I love the chipboard globe with the 'I was here' layered over it. That would work great with a vaction layout but it also works well here. Very cute. I hope your son's arm heals quickly. I like the colors on your layout. Mine is six and no broken bones, yet! Loved that you mixed it up! That is another nice OA line! That is a super cute collection and great layout! Adorable page. I never really buy themed stuff because I always think it is limiting, but afterseeing your layout and reading your post, I have changed my mind. Great layout! I have some pics of my oldest that would for this idea as well. Never would have put broken bones and rite of passage together...but I think you did a great job! I like the idea of using your theme embellishments for a non-theme related layout. I think I may need to look through my stash with new eyes. Very unique idea of using travel theme as a rite of passage layout. Thanks for the neat idea! This is a great title for this page. Love your layout. The papers look great. Thanks for the chance to win! Cute layout I would never had thought to use that line for that type of layou way to think outside the box! Very cute! I love the paper you used! Thanks for the chance to win! Great page. 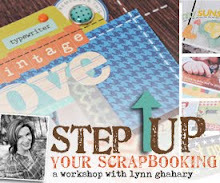 I love the inspiration of a blog hop! I think it's a great page and the Boarding Pass line was perfect. I love your bright and happy looking LO! Love the TWINE so cute! You put a cheerful spin on what I'm sure was a painful situation. Nice masculine feel but still fun. What a creative way to use travel themed products for a different kind of journey! Great layout! Thanks for sharing your great layout! Oh yes been there done that, but my son broke his arm falling off a porch railing he was sitting on. Lovevhow you scrapped that memory. Cute idea for that line of products! I am always amazed at how designers think outside of the box. Thanks for sharing! Very cute page and I love the concept. I love the way you used the embellishments in a cluster. Fun layout with a fun twist on "themed" paper/products!!! Thanks for inspiring!!! I love your layout and I love OA. Thank you for the inspiration! So cute! Thanks for the inspiration! This layout is beautiful... I have 2 boys so I love boy-layout inspiration. 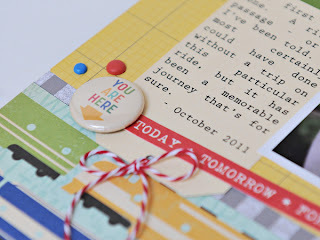 I love the use of the travel paper in this layout makes me rethink my stash!!! TFS! LOVE your layout- SO your style and so colorful! Thanks for sharing and thanks for the chance to wn- who doesn't love 2Peas! Love the use of the travel theme to document the journey of life. Love to see this line used in a non-travel way. I have the 8X8 pad and can't wait to use it! What a great collection to use with a personal "journey" story! Awesome layout!! You are very creative to use it another way!! You gals are so amazing. Very cute! Beautiful layout, and I LOVE the way you used boarding pass collection. Lovely. I really like how you used a themed supply for this LO. And I love that you use the "permission granted!" approach to scrapbooking! I love, love, love this page! October Afternoon rocks! thanks for the hop and sharing! Wonderful use of Boarding Pass! This is a wonderful (if a bit of sad occaision!) layout! It's nice to see a smile on his face! Lovely piocs and great design! One son down one to go (on the broken bone front), although I wouldn't mind skipping this rite of passage! The yellow on your LO looks wonderful. this is adorable Lynn !!! Cute page & a great idea, too! Ohh love that OA, I heart the tin pins! Hope the arm heals soon! Love your layout, Lynn, and thanks for the chance to win! Great layout. Love the Boarding Pass collection. Thanks for the inspiration and giveaway. What a fabulous layout! I love all the great coordinating elements you used. Fun! What a great way to expand your scrapbooking beyond the traditional use of a theme! 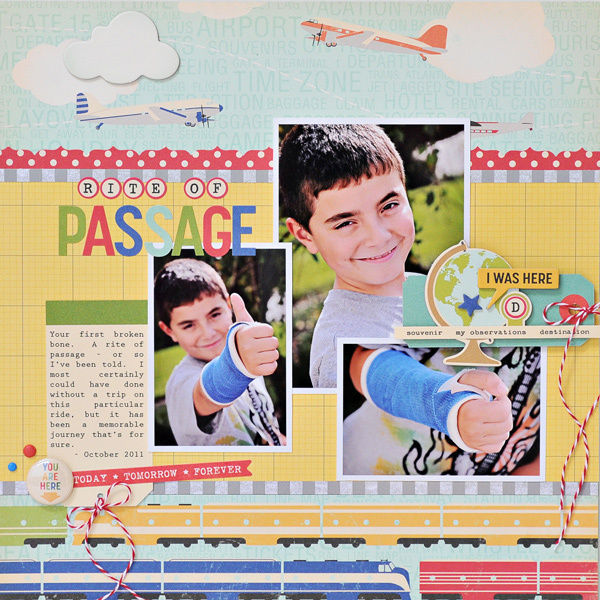 Great idea to use travel papers for a layout about his "journey". Great layout! I love using themed products for something other than what they were intended too. Great layout, thanks for sharing and the chance to win! Love the hop. Very cute layout - thanks for sharing!! I love your layout, what a great idea, and definitely inspirational as well. I want to try this using a random theme and making it my own! Awesome, thanks for the chance to win. What a cute page. Thanks! Very clever layout theme. Love it! Excellent layout! Thanks for the opportunity to win! I love anything by October Afternoon...love the bright colors on the layout...fun! Great page and lovely detail shots. I like using themed paper for non-theme layouts, too. really cute!! love "Boarding Pass"!!! what a great blog! so glad you all did the hop so I could find you! I like the pastel colors you chose for your layout. And your patterns. Fabulous layout. Love how you used travel paper! this is wonderful! thanks also for a chance to win! What a great way to stretch the stash! Great layout, love how you used Boarding Pass! Now how clever is that page?! It is a rite of passage to break a bone! Hope you never have to do another broken bone page!! He is so cute! 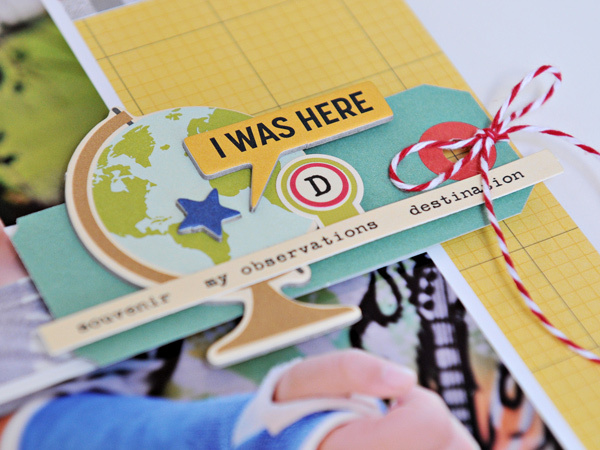 Very cute layout - love how you were able to get 3 photos on the page and all the fun embellishments. Thanks so much for sharing and the chance to win - love 2peas! I'm not too good with embellishment clusters but I love the one on your page! I just love the products you used such a wonderful page ! What a clever idea to incorporate a different theme into you layout. Very cute. Love all the little embellishments, they are really great. I love your colorful LO! Thansk for the chance to win! Fun layout! Boarding Pass is such a cool line... I haven't had a chance to play with it yet, but I have tons of pics that would be perfect with it! Great LO - love it. My son's first bone was his nose at 7!!!! What is ahead of us! TFS. what a great way to show 'travel' products in a different way. love love love! Boarding Pass is such a great line, and I love that you showed its versatility. I think your page is super and the theme is perfect! Super cute layout and great use of that line. Thanks for sharing the layout! I like making travelling layouts so I can't wait to get this collection soon. I like that you used Boarding Pass for this...I am going to challenge myself to use something "themey" where it doesn't really match!